I know, I know - you read social media, and you hear that the Finance Folks ... the Beancounters ... they're always messing with what you want to do ... they're questioning why your ad-to-sales ratio is two points higher than two years ago ... they're wondering why return rates crept up marginally. There's a reason they do this. They sweat the details so that your business is healthy. Look at these two companies ... one healthy, one unhealthy. Both businesses generate $100,000,000 demand ... in other words, in both businesses, customers wanted to purchase $100,000,000 last year. Now look at the subtle differences. The healthy business fills 97% of items / the unhealthy business fills 96%. The healthy business has a 23% return rate / the unhealthy business = 25%. 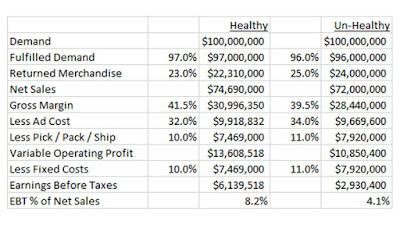 The healthy business has a 41.5% gross margin / vs. 39.5% at the unhealthy business. The healthy business has a 32% ad-to-sales ratio / the unhealthy business = 34%. 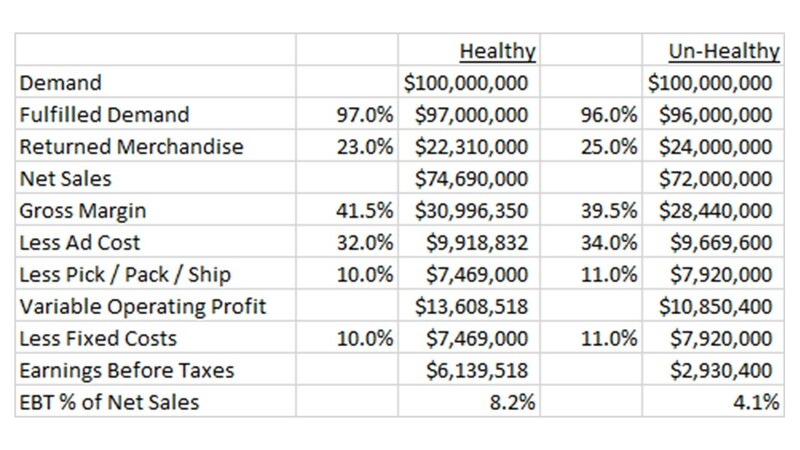 Warehouse costs are 10% for the healthy business / 11% for the unhealthy one. Fixed costs are 10% for the healthy business / 11% for the unhealthy business. Those aren't big differences, are they? But when evaluated across the profit and loss statement, the result is dramatic. The healthy business generates $6,139,518 Earnings Before Taxes. The unhealthy business generates $2,930,400 Earnings Before Taxes. Every step in the profit and loss statement leaks one point or two points. And that modest level of leakage results in an unhealthy business - one earning less than half the profit of the healthy business. Think about this, my friends. Each business is equally successful at getting customers to buy stuff ... and that's the hardest thing to accomplish. This isn't the fault of the marketer, and it isn't the fault of the merchant. It's caused by all parties being sloppy. The merchant doesn't forecast sales accurately or doesn't hustle when stuff sells out. Instead of pleasing the customer the first time around (all aspects of the business), the unhealthy brand allows a return rate two points higher. Incorrect forecasting leads to worse gross margins due to increased liquidations. The marketing team are lazy and don't measure lifetime value properly and as a result bid too high for various keywords. One warehouse uses people, the other robotics, resulting in a one point change in pick/pack/ship expense. One business makes bad capital decisions, the other is careful, resulting in a one point change in fixed costs. 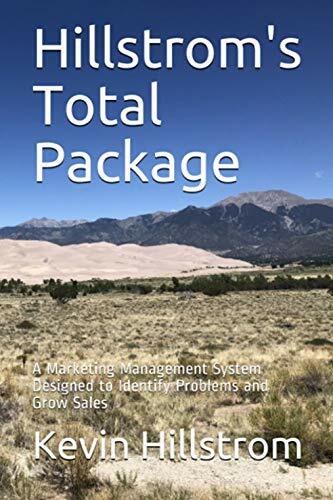 There are simple fixes to all of these issues ... the unhealthy business chooses not to implement the fixes ... they fire the Marketing leader and hire a new one ... every two years (it's her fault). No, it's the fault of the culture at the unhealthy business - a business that does not sweat the details. This is why you Finance Team behaves the way they behave.